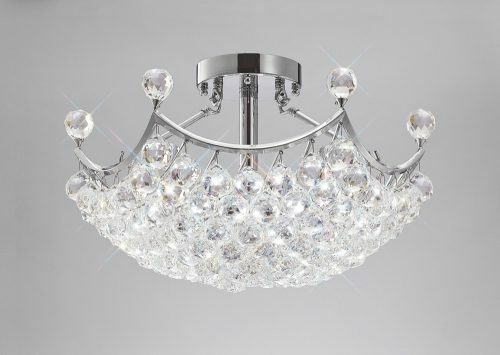 An extravagant stunning Polished Chrome fitting filled with an abundance of 40mm Asfour crystal spheres. The larger fitting is supplied with a chain suspension while the smaller fixture is semi flush. The basket of crystal spheres has been designed so that every single crystal is making contact in order to create a continuous sheet effect. The upstanding crystal spheres and crystal ball in the suspension rods ensure no detail has been missed to create this magnificent range.